With November quickly approaching it’s almost time for “No Shave November,” a tradition more commonly known as “Movember.” For those unfamiliar with this holiday, it’s the one-month where all men stop shaving and let their moustaches grow. The moustaches are intended to promote conversations, raise funds and spread overall awareness about serious men’s health issues including prostate cancer, testicular cancer, and mental health problems.This year here at 18|8 we want to take part in this beloved tradition, so we’re helping out with the first rule of Movember on November 1st with our “Shave The Date” event. Come in on November 1st and we’ll give you a straight edge shave so that you can start off Movember the right way with a clean shave. 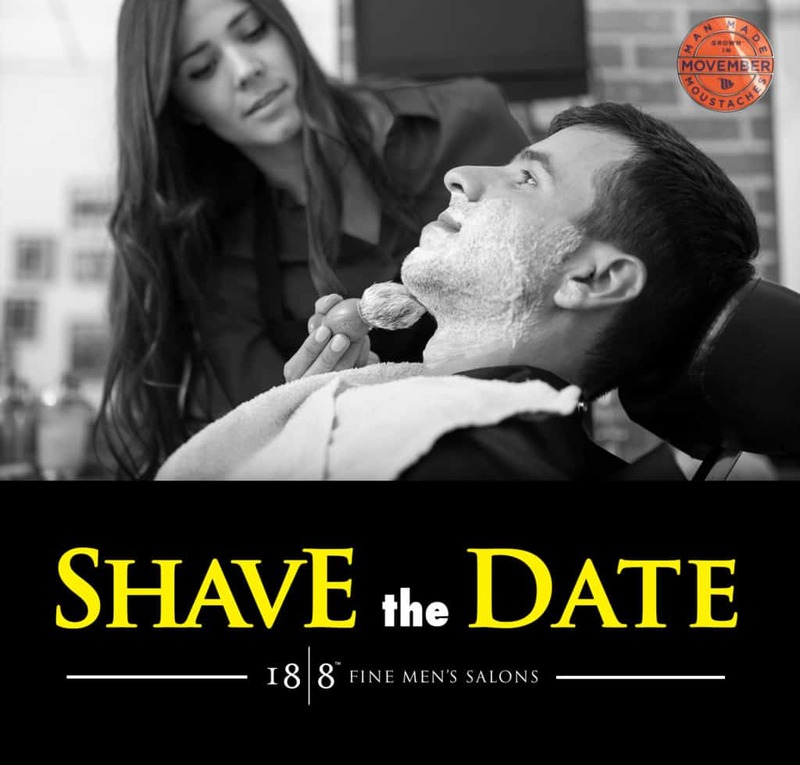 We will donate all proceeds from our Shave The Date Event to the Movember Foundation. Most are surprised to find out Movember all started as a simple dare in an Australian pub in 2003 amongst friends as a way to bring back the famous 70s moustache, also known as the “stache.” At the end of the month the group of friends got together to award the best and worst moustaches. After having so much fun growing out their moustaches for the month of November, this group of friends went on to form the Movember Foundation. A foundation dedicated to raising awareness and funds for men’s health issues. No faking: no beards, no goatees and no fake moustaches. Use your moustache for good, create conversations to spread awareness about men’s health prostate cancer, testicular cancer and mental health. Shave The Date With Us! During the month of November, 18|8 will also be running a social contest for you to enter your stache in for a chance to win prizes. To get started join us to help kick things off at our shave the date event this year November 1st and we’ll help you give back to this great cause!